For the very first time, Cracking Art will be exhibited in luxury hotels. First, the installation will be at Four SeasonsHotel Milano to celebrate the Hotel’s and the famous art movement’s 23rd birthday. Colourful works will displayed in the hall, the garden and balcony overlooking the entrance as this spectacular exhibition opens on April 12 and continues through May 31, 2016. 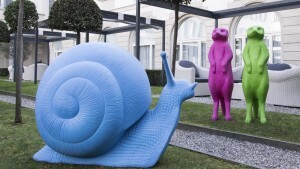 Then, beginning June 1 and continuing throughout the summer, Cracking Art moves to the beautiful outdoor spaces of the Palazzo and La Villa at Four Seasons Hotel Firenze. The term Cracking Art derives from synonyms for “crack”: fissure, break, crash, snap, pop, collapse. Cracking is also the process that transforms crude oil into virgin naphtha, from which a wide range of petroleum-based plastics are made. Artists of the Cracking Art Group believe that cracking is also the gap of the contemporary man, struggling between primary naturalness and a more and more artificial future, but also the inevitable process that converts the natural into artificial. Founded in 1993 by six European artists who took part in the Epocale exhibition in Milan curated by Tommaso Trini and Luca Beatrice, the Cracking Art Group immediately made clear its intention to become part of art history through strong social and environmental commitment, combined with the revolutionary use of plastic materials evoking the close relationship between the natural and the artificial. Plastic recycling means avoiding release of toxic fumes into the environment. Transforming plastics into works of art placed in urban settings, monumental and historic settings, means communicating through an innovative aesthetic language and expressing environmental awareness, support to cultural associations and protection and restoration of historical monuments and sights. The Cracking Art movement has already launched 380 “invasions” of oversize animals all over the world: from Bangkok to Moscow, New York and Sydney, and throughout Italy in Rome, Florence, Trieste and Naples. The group has been very active in Milan, where its giant animals have “invaded” the Duomo’s steeples, the Sforzesco Castle, the Darsena and Porta Venezia. Cracking Art artists have decided to bring four types of animals to Four Seasons Hotels Milano and Firenze: the wolf, which communicates the idea of the herd, of acting for the common good, but also the idea of solidity and individual strength; the meerkat, a small and cute mammal whose social life is based on mutual collaboration; the snail, which is the symbol of regeneration, of home and of the gift of hearing; and the swallow, which suggests the idea of travel, but also of coexistence with mankind, as it makes its nest in inhabited houses. Italy’s prestigious Four Seasons Hotels will be filled with notes of bright and intense colour, which are also an invitation to reflect upon contemporaneity.